Fox Searchlight Pictures has released the A United Kingdom trailer, which you can watch using the player below. 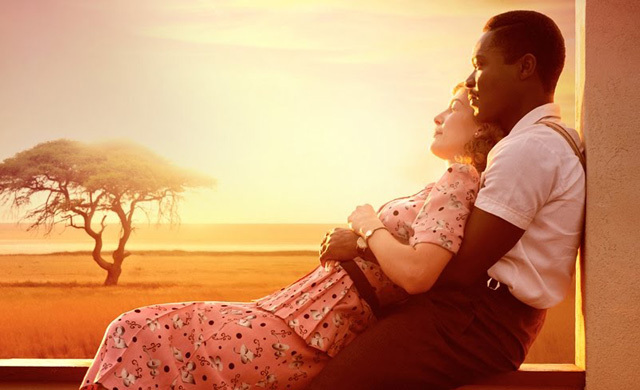 Directed by Amma Asante (Belle) and written by Guy Hibbert (Eye in the Sky), A United Kingdom stars David Oyelowo (Selma) and Rosamund Pike (Gone Girl) and is produced by Richard McCallum, Oyelowo, Brunson Green, Peter Heslop, Justin Moore-Lewy and Charlie Mason. The film was financed and produced by Pathé, BBC Films, the BFI and Ingenious Media. A United Kingdom is scheduled to be released on February 17, 2017. A United Kingdom is a Pathé, BBC Films, BFI, Ingenious presentation with the participation of Canal + and Cine + of a Yoruba Saxon/Harbinger Pictures/Perfect Weekend/ Film United production of a film by Amma Asante.